March has come around in full force in Key Largo and as expected the fishing is spectacular. Anything from Amberjacks to Swordfish to Dolphin are biting well. This is the time of year when the Amberjacks migrate to the Florida Keys to spawn, and there are plenty of them around the offshore wrecks and seamounts. The size of these jacks are averaging 40lbs. with some reaching into the 60 to 70lb. range. Check out this picture of Chris withan 80lb. beast. We like to drift over the wreck and drop two lines with live blue runners or google-eyes. It is almost guaranteed that when your bait drifts over the wreck it will get clobbered by a giant Amberjack. 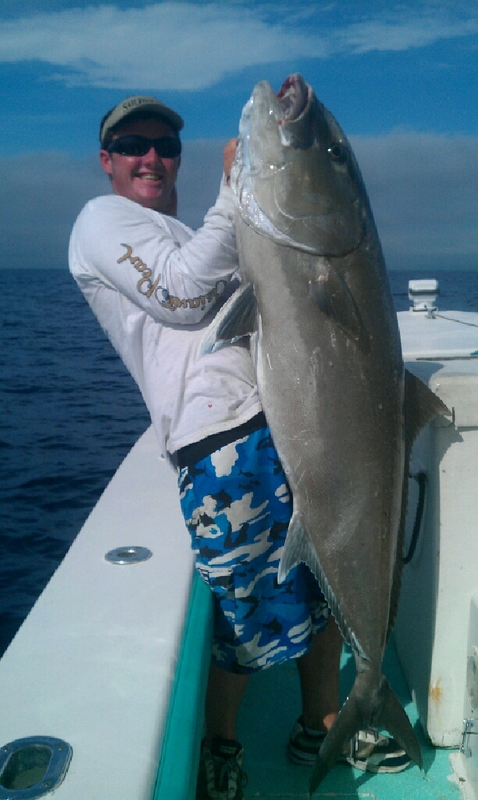 We had an excellent day of Amberjack fishing last Sunday catching one weighing 82lbs.. The next jack we were reeling up from the depths had a follower with it. A Hammerhead shark weighing app. 300lbs. chased the jack right under the boat. You could have reached out and touched the shark. It didnt take very long when the shark grabbed the Amberjack and ate it in one bite. The Sailfishing is still good. They have been biting north of Key Largo so we have been planning on longer run times but have been paying off well with 3 to 6 releases average.